As genealogists, we learn to use all kinds of tools in our research. We use land records and probate records. We seek out court minutes from dustry corners of old courthouses and personal papers long ago left behind in libraries and historical societies. We look to records created by cemeteries and churches and the military and government at all levels. We use 21st century tools like DNA testing. And we even do something it seems is fairly rare these days. We use the grey matter between our ears. So The Legal Genealogist is feeling just a little snarky this morning. Twice yesterday I came across one-liner notes on websites that left me shaking my head. Because both of them suggested that the web writers didn’t know the answer to a question that we, as genealogists, could have answered in minutes. Because, you see, we use all kinds of tools in our research. But we know … and they could have figured it out … if they’d looked at the newspapers of the day. 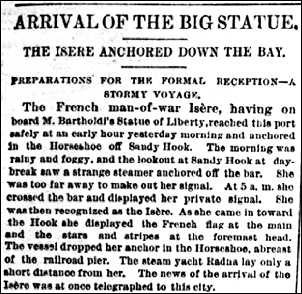 Even a quick look at the newspapers of June 1885 would have shown the web writers that the statue arrived in the waters off Sandy Hook, New Jersey, on the 17th of June 1885 in the French man-of-war, the Isere.2 It was one of the biggest stories of its time… and it isn’t hard to find. Now perhaps it isn’t fair to be snarky to a website that uses the web address www.lotwot.com. I suspect that isn’t exactly a website dedicated to scholarship. I was disappointed because, in the course of discussing the broadsides — which really are amazing, and (not surprisingly) resulted in a libel suit — the article reported: “we have not been able to locate the results of this Harlan County election…” to see which of the two candidates (J. B. M. Howard or John Keller) had been elected as the magistrate. But we know … and they too could have figured it out … if they’d looked at the newspapers of the day. Now admittedly it may not be that even the best of law librariies have subscriptions to newspaper databases. And we think about all the ways we can find the answers we need. REMINDERS: Today is the early bird deadline for registration for the 2015 Ohio Genealogical Society conference — Ohio: Your Genealogical Cornerstone — in Columbus, April 9-11. Registering today saves you $40 on the full conference fees and also gets you an advance electronic copy of the syllabus and first dibs on workshops and other events that might sell out. Information on OGS 2015 is here and you can register online here. And registration for the April 15 Tech Day at NERGC 2015 — Navigating the Past: Sailing into the Future — in Providence, Rhode Island, is already full for both tracks. But there’s still space available in the Librarians’/Teachers’ Day Track and in the workshops during the April 15-18 conference — things like Military Research, Mechanics of Writing, Document Analysis and Griffiths Evaluation. Information on NERGC 2015 is here and you can register online here for the whole conference and for special add-ons like the workshops. See e.g. “Draft Dodger Is Arrested in Harlan,” Lexington (Ky.) Herald, 10 June 1942, p. 3, col. 6 (“… charged before Magistrate John Keller …”); digital images, GenealogyBank (http://www.genealogybank.com : accessed 17 Mar 2015). This article was published by IowaWatch.org regarding the preservation of newspapers at the State Historical Library. Ouch. That’s downright painful… Hope Iowans can convince the Powers That Be that this is a worthwhile use of funds. Having worked at the “Dallas Times Herald” for 27 years our archives were a source even for the editors. Occasionally they would dig back for confirmation on a story. We heard a story that my wife’s grandfather had been killed by a train in Dallas. Went to the Dallas Library with the info of about when he was killed. Found the article and it was very descriptive of what the train did to him. Whew! Little TMI. Newspaper archives are a wonderful amazing resource, Stan, but I can sure understand how sometimes the details to family would be TMI!